A Presentation by Guy Bud of Somerville College, Oxford University. The importance of coin finds on an archaeological site has long been recognised, that together with ceramic evidence provides the archaeologist with a key dating tool for a site. 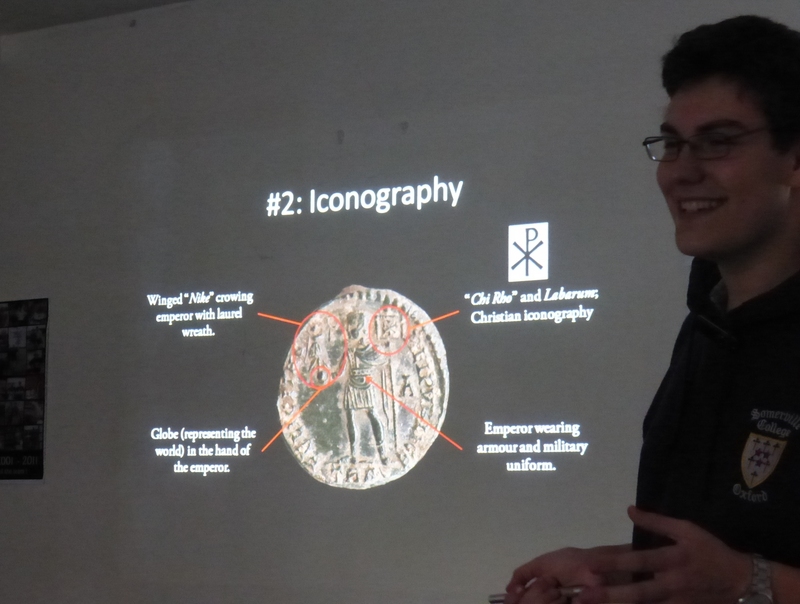 Coins also provide insights into the wealth of the site and its occupants, their possible commercial activity and as we learned from the presenters analysis of the coins, there may have been a votive use of the coins that link them more closely to the Marcham/Frilford site. 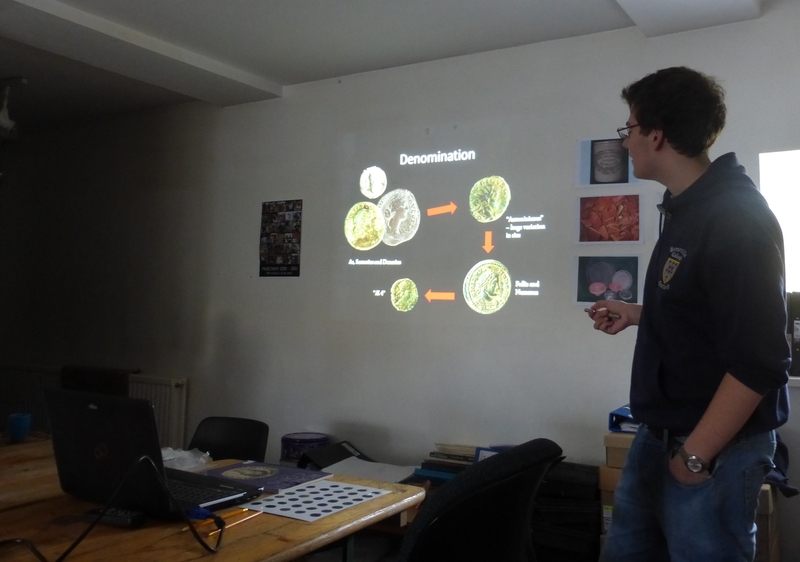 It was therefore with great interest that a group of Trendles Project volunteers received a presentation based on the Roman coin finds from the Marcham/Frilford site given by Guy Bud of Somerville College, Oxford University. Guy opened the presentation by putting the coin finds into perspective, positioning the 2500 plus coins recovered over the 11 seasons of archaeological activity as the 10th largest group of coins found on an archaeological site in the UK. In date the coins spanned a period from A.D. 70 through to the early 5TH century. Guy pointed out that the group of coins were entirely Roman and with a surprising number from the early 5th century. Given that Roman activity and occupation had greatly diminished by that time, with 410 being regarded as the date for the Roman withdrawal from Britain, may suggest that a level of occupation together with its cash economy continued for some time after the Roman withdrawal. The metals from which the coins were made. For the most part the Marcham/Frilford coins were base metals such as copper and bronze with a small number of silver coins. The denominations of the coins and their relative values with some interesting comparisons with today’s monetary values. Coins such as the antoninianus, follis sestertius and denarious to mention a few. The all important dating of the coins which is largely through the Emperor depicted on the coin and the known period of their reign. Where the coins were minted. This is made easier for coins after the mid 3rd century, around AD 250 when marks identifying the mint began to be put on the coins. This became more widespread after the monetary reforms of the emperor Diocletion in about AD 286. Mint marks usually took the form of abbreviation of the mint name such as ANT for Antioch or PLON for London and TR for Trier in Germany. These mint marks were an important measure against fraud enabling the traceability of coins that were being debased thereby reducing their real value. The obverse of the coin usually depicted an image of the emperor set within a border of his various titles that impressed the holder with his rank and status. The titles were normally in Latin and abbreviated to allow the maximum use of the coin for their grand array of titles to be included. 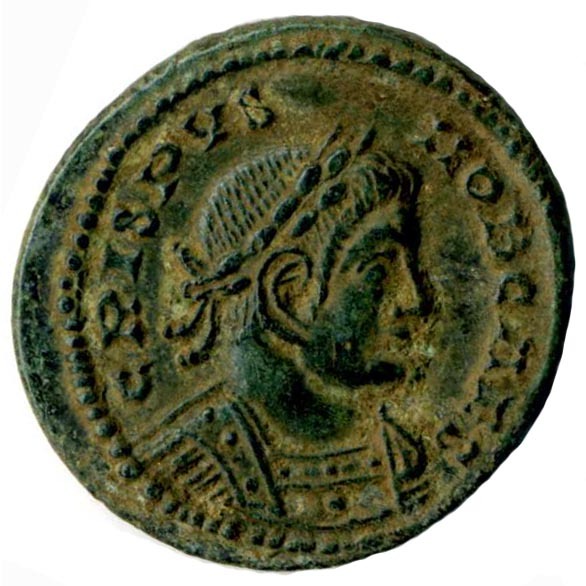 For example on a coin of Constantine The Great (307-337) we see IMP.CONSTANTINVS P.F AVG. This tells us that IMP which stands for Imperator denotes his supreme command over all the legions (this was dropped in later 4th century for D N an abbreviation for Dominus Noster meaning Our Lord). Then the name of the emperor. The P.F for Pontifex Maximus or chief of the priests a title assumed by the emperors at the time of their accession, and AVG or Augustus being a title bestowed on all emperors indicating their supreme authority. The reverse of the coin also provides much information about the emperor and their various deeds. Often depictions of the emperor as soldier and leaders of the legions, as a conquering hero or in the guise of many deities and personifications often receiving gifts from winged Victories for great deeds done. These images were again surrounded with inscriptions that further embellished the emperor’s status. 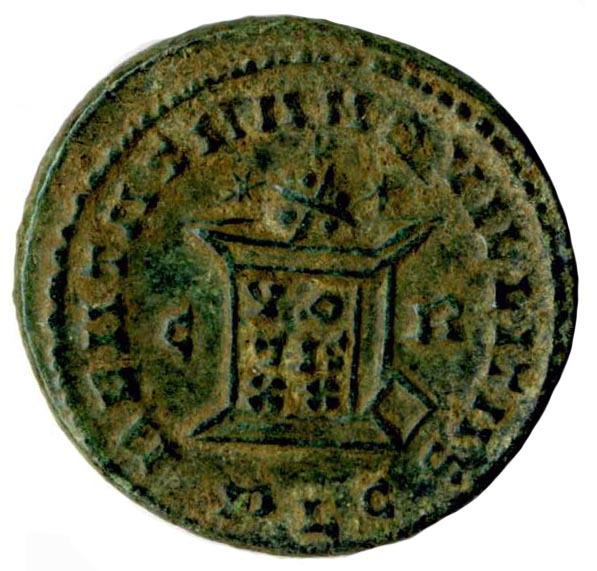 In the late 3rd century a common reverse type showed the emperor with two captives bordered by the inscription Fel Temp Reparatio meaning the ‘return of happy times’. It is to these last two aspects that Guy suggests that there may be a votive usage of the coins that might explain why they were in such abundance at the Marcham/Frilford site. Clearly the coins provided each emperor with an opportunity to propagandise the coins and to present themselves as deities. This is suggested by the titles explained above, ‘chief of priests’, ‘our lord’ and ‘supreme authority’. If this is the case and emperors were truly regarded with such high esteem then these coins may have taken on a votive importance at Marcham/Frilford and been involved in ritual activity. This of course has to be proven but it does provide an interesting avenue for future analysis and understanding of the Marcham/Frilford coins.